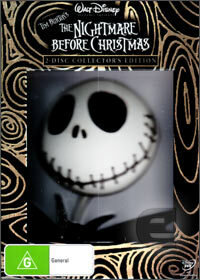 One of the world's most original director's returns again on DVD and Blu-Ray with Tim Burton's the Nightmare Before Christmas Special Edition which once again returns viewers to the wondrous world of Christmastown. This amazing modern fantasy revolves around Jack Skellington and his rag doll friend Sally who embark on a magical journey to the land of Christmas. Even though Jack and Sally come from a gloomy place, when he discovers the land of Christmastown, his views on life soon change as he attempts to bring his ghoulish friends into this shiny bright world. Unfortunately for the denizens of Christmastown, things begin to go astray as they are invaded by these strange, almost demonic like creations. What sets this fantasy apart is the amazing stop motion animation which is sheer brilliance that is matched with extremely likeable characters and a story to boot. Tim Burton's vision of this strange land pushes the boundaries of Hollywood and even though the film is over 15 years old, is still one of the most popular films of this genre which has spawned a variety of merchandise for this cult hit. Match that with some wonderful special features such as audio commentary, deleted scenes, making of documentary and a variety of other Nightmare Before Christmas featurettes and this is the perfect compilation. Charming from the very first minute!